Discussion in 'the Art of Noise' started by LolaSvelt, Jul 4, 2009. There was a thread for this band but it was about the song In It For the Kill, so if moderators feel that they should merge our threads together, I don't mind. 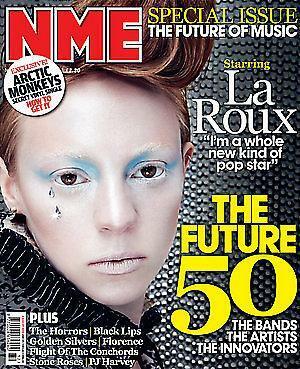 You can talk about anything La Roux here. I can't wait to hear their album. I first thought that the singer over-sang slightly, but now I love her. Seen her wearing Henry Holland in the Bulletproof video? And that amazing Mondrian/YSL-esque jacket - great. I got the album yesterday but haven't listened to it all yet. There's some killer pop tunes on there. I also like the fact that Elly's got a very definite idea about having her own image - very androgynous and with the amazing hair - that sets her apart from other female singers. My only criticism is that when she sings in a higher register it gets a touch wearing after a while. Their music is ok, but she should learn to shut her mouth from time to time. I find her disgustingly annoying. So far I only listened to the songs - haven´t seen a performance - and I definitely like their music. ^Yeah, there seems to be a new wave of twentysomething British singers with unique sounds this year. Last year was the songstresses (Duffy, Adele and even though she was around for quite a while, Estelle finally got some deserved attention). that's how i feel as well...that voice. a bit irritating to my ear. i like unique voices...kazu makino from blonde redhead...but i find that her voice tends to meld with the music..la roux sounds a bit disconnected. I can imagine Elly in a Chanel campaign soon. ^ seriously? because that would be amazing. I just realised I called the song In It For the Kill in the original post. la roux performed live on 'it's on with alexa chung' today.